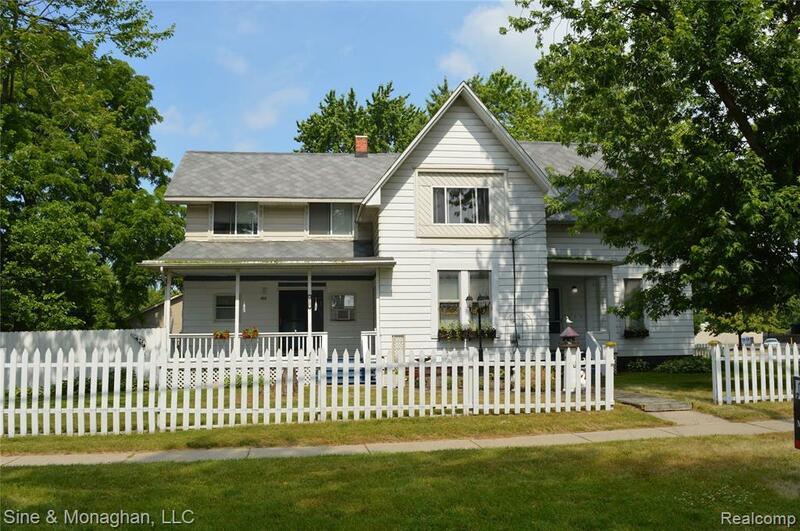 NEW PRICE ON THIS FANTASTIC TURN OF THE CENTURY HOME LOCATED JUST OFF OF THE ST CLAIR RIVER. THIS HOME FEATURES GREAT VIEWS OF THE RIVER AND IT IS THE PERFECT LOCATION TO ENJOY THE 4TH OF JULY FIREWORKS SHOW. FEATURES INCLUDE ORIGINAL WOOD MOLDINGS, STAIRCASE, AND 10 FT CEILINGS -UPDATED GALLEY STYLE KITCHEN INCLUDING A BREAKFAST NOOK AND DINING AREA -A FORMAL PARLOR/DINING ROOM- FORMAL LIVING ROOM- 1ST FLOOR BEDROOM-FIRST FLOOR FULL BATH/LAUNDRY-NEWER CARPET- UPSTAIRS INCLUDES A HUGE MASTER BEDROOM-OPEN CONCEPT LIVING ROOM INCLUDING A GAS FIREPLACE-LARGE 2ND BEDROOM- A RETRO STYLE KITCHEN WITH BUTLERS PANTRY-2ND FLOOR FULL BATH- HEATED MUD ROOM OVERLOOKING A LARGE DECK, PATIO AND SWIMMING POOL GREAT FOR FAMILY GATHERINGS-LARGE YARD WITH PLENTY OF ELBOW ROOM-SHED-NEWER SHERIFF GOSLIN ROOF, BOILER, ELECTRICAL, DOUBLE HOT WATER TANKS -APPLIANCES & HOME WARRANTY INCLUDED-ENJOY THE PUBLIC SWIM & FISHING AREA -WALKING DISTANCE TO MARINAS, SHOPS, AND THE ALGONAC WATERFRONT BOARDWALK.